Blackened walleye, sirloin or chicken. Pan fried, blackened, or deep fried, veggie, cheddar mashed potatoes. Romaine & iceberg lettuce, grilled chicken, tomato, green onion, corn, blue cheese, bacon, avocado, tortilla strips, Lime vinaigrette dressing. 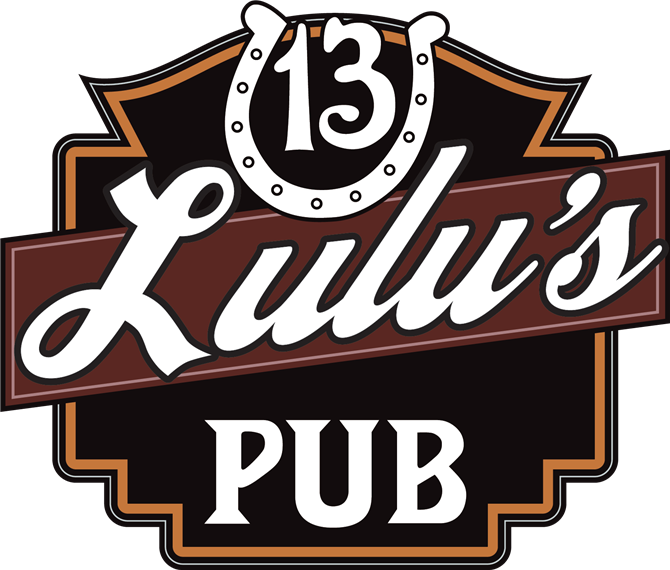 Lulu’s 13 uses fresh never frozen hand pattied Angus beef. Substitute a Turkey Burger for FREE. Choice of meat and choice of toast, 3 eggs cooked to order and breakfast potato. One fried egg, American cheese, 2 slices of bacon, on a English muffin. Breakfast potato. English muffin, sirloin, poached eggs, horsey, holly, & breakfast potato. 1 English muffin, thick cut ham, 1 poached egg, hollandaise sauce & breakfast potato. Try our famous B.L.T. Bloody Mary!